-Look at that healthy young boy! That is today's youth for you. They have no respect for elders. He rides on the donkey and makes his poor father walk! -That just goes to show how hard it is to escape the opinions of men. Hodja's wife was pregnant. One night, her labor pains started and Hodja called the neighbours and the midwife. Soon they called out from his wife's room and said, "Hodja! You have a son!" "Hodja! You also have a girl." "Hodja! You have another girl!" Hodja, who had been waiting in front of his wife's room, rushed into the room and bleww off the candle. "What are you doing?" asked the surprised women. "Well! Everyone who sees the light wants to come out. What else can I do?" he answered. "Do you have some forty-year old vinegar?" "Would you give me some? I need it to prepare a medication", said the man. "No, I won't," replied Hodja. "If I had given some to everybody who asked for it, would I have it for forty years!". During a conversation with Tamerlane, Hodja started bragging about his donkey. "It is so smart that I can teach it even how to read, "he said. "Then go ahead and teach it reading. I give you 3 months.," Tamerlane ordered. Hodja went home and began to train his donkey. He put its feed between the pages of a big book and taught it to turn the pages by its tongue to find its feed. Three days before the three month period was over, he stopped feeding it. When he took his donkey to Tamerlane, he asked for a big book and put it in front of the donkey. The hungry animal turned the pages of the book one by one with its tongue and when it couldn't find any feed between the pages it started braying. "This is sure a strange way of reading!" "But this is how a donkey reads." Oh, my coat fell downstairs. If you were in it, like me, yes! This hen is mourning for its mother !!! Dear God, he said. Please send me a donkey ! A few minutes later, he saw a man riding on a horse and leading a young donkey. You, leprous man! Instead of starving there, come on carry the donkey, it is tired. Although the Hodja said, that he was also tired, the tyrannical man beat him with a stick and so the poor Hodja took the donkey on his shoulders. Oh, God! What happened? Was it that I couldn't explain, or that you couldn't understand? In his dream some people gave the Hodja nine gold coins, but Hodja wanted ten.-So he refused them. Suddenly he awoke and saw that his hands were empty. So he quickly closed his eyes again and said: It's okay, I'll take the nine coins. When his wife died, the Hodja became very sorry, but he mourned for her only a few days. After a while his donkey died and he was even more sorrowful and mourned for him many months. When my wife died, they all said, they could find a younger and better one for me, but when my donkey died, nobody offered the same service. One day a man asked the Hodja to write a letter for him. Where will the letter go? the Hodja asked. To Baghdad, said the man. I cannot go to there, the Hodja told him. Nobody can read what I write. Therefore I must go there to read it. 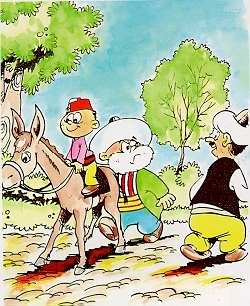 One day the donkey of the Hodja got stolen. The Hodja began to search it. While searching, he was shouting. The judge who saw that, asked him Who has stolen your donkey, and how? The Hodja became very angry and said: If I knew the answer, my donkey wouldn't have been stolen! If the judge asks you 'did this man give away all the gold coins' you can tell him that I did. They appeared before the judge and the Hodja gave evidence that the man had indeed given away all the 'silver' coins. The judge accepted this and they were dismissed. Hodja Effendi, why did you say 'silver' instead of 'gold'? If it is a lie, answered the Hodja, what does it matter, what it is? One day, a thief came to the house of the Hodja and took everything he had except the blanket which covered him. When the Hodja saw the thief carrying all his things away, he put his blanket over his shoulders and followed him. When the thief arrived at his own house, he turned back and saw the Hodja. What am I doing here, said the Hodja, you ask a thing like that? Didn't we move to this house? In a village where the Hodja was giving a speech, he told the people assembled there about Jesus, how he lived in the heavens. One old woman was very curious and asked the Hodja, what this Jesus ate in Heaven. You, silly woman, why do you ask what Jesus eats in heaven when you cannot remember to ask what the poor Hodja Nasreddin eats on the earth! During the birth of his children, the Hodja stood holding a lighted candle. Because, while there was light, first child was born, and then another. Who knows how many more there may be! When the Hodja was in bed, he heard a thief walking on the roof. He quickly thought of a trick to catch him. One day when I lost the key and when you weren't at home, I said a prayer held on to the moonlight and jumped into the house from the roof. Then he said a short prayer. The thief, listening to the Hodja believed to these words, so he said a prayer held on the moonlight and fall into the house. The Hodja caught him and ordered his wife to bring a rope. No need, Sir, said the thief lying on the floor As long as you have that prayer and I have that brain, I cannot escape. One day when the Hodja went to the baths, his friends wanted to play a joke on him. They each took an egg with them and came to the baths. 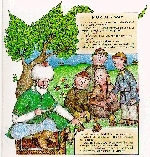 Hodja Effendi, said one of them. Everyone will say chuck-chuck-chuck and lay an egg. The one who cannot do this must invite all the rest to dinner. What is that? they asked. Do not so many hens need a rooster? he replied. I cannot read that, it isn't written in Turkish. You are a teacher. You should be ashamed of your turban! You cannot read a letter. If the miracle is on the turban, take it and read the letter by yourself. At the time of Temur no one was allowed to carry a knife or a gun. But, I use it to scratch out the mistakes in the books. But why is your knife so big? Because the mistakes are big! As a teacher I must be in front of you. But if I face the front, I cannot see what you are doing behind me. Therefore, if I sit on the donkey this way, I can see you all quite easily. One day a man said to the Hodja that he saw a man bringing a roasted goose. It doesn't interest me, said the Hodja. But it was going to your house, said the man. Then it doesn't interest you, replied the Hodja. One day, a man came to Akshehir and wanted to see the Hodja, who was famous as a great joker. He saw a man leaning on a wall and asked him if he knew where the Hodja was. This man said that he was busy at the moment leaning against the wall so that it would not fall down, but if the man would do his job he would go and look for the Hodja and call him. The man said O.K. and leaned against the wall. He waited and waited but the other man did not return. Didn't you believe that the Hodja was a joker? That was the Hodja to whom you spoke. When the Hodja had no job he went to the head-judge and asked for a job. The head-judge said that all places at the court were full and there was no place for the Hodja. Let me be the shadow judge, said the Hodja. You can send the interesting law suits to me. The head-judge liked this idea. So the Hodja began to his job, having a good office to work in. Every day the Hodja came to his office, put the papers in front of him, waited until the evening, and went home. He did nothing during this time. This man was cutting that beat on the wood I said 'hink' and this made him stronger. Now I want my money. The head-judge thought and thought, suddenly he remembered that there was the shadow judge for such lawsuits and sent the men to him and he listened from behind the door. The Hodja listened to the man, took the piece of wood and turned to the wood cutter. Give me the money you got for this wood cutting. He took it, then let it fall on the wood and said: You wood cutter, take your money and go! And you, the 'hink' sayer, take your voice and go! Does all this food belong to you? You silly man, said the Hodja. Why do you stand here, instead of eating it all? The Hodja collected over many years 1000 coins and one day a thief came and stole the money. The Hodja was very sorry and prayed every night. I am a sailor and the ship I was on was in perie. The waves lashed the ship and we were all very frightened. So I said: 'If I return safely on land, I will give 1000 coins to the Hodja' and here they are. Dear God? what a strange job you have. Where did my money go and from where does it return! What is the use of this? Hodja Effendi, to which side must I turn when bathing in the sea? To the side where your clothes are. When the Hodja was repairing the roof a man called him from below. What do you want said the Hodja. Come down for just a minute, he said. I'll tell you something! The Hodja got down and the man said: Can you lend me some money? Come, said the Hodja, for just a minute up above. One day the Hodja wanted to eat peaches and he saw a garden full of peach trees. So he climbed up the tree and began to eat them, one after the other. You, come down, a nightingale doesn't sing like that! What didn't you like?, shouted the Hodja. Can an inexperienced nightingale sing better than this? You silly bird, you know when it is morning because you are crow, why don't you know the way to Akshehir? You know the storm we had yesterday, said the Hodja. It blew me here. And who broke off this fruit? I wanted to hold on to the branches and they fell down. And who put this fruit in the bag? I was just thinking of that, said the Hodja. Come on, we'll think together! In the time of Temur, he was very strict and everyone committing a crime was beaten. One day the Hodja was with him. Temur was shouting. Beat this man 700 times!, This one 1000 times!, This one 1200 times!, This one 1500 times! Of course, shouted Temur angrily. No, said the Hodja. Here is something which you don't know. It is the meaning of the number 1500 or the taste of the stick. One day one of the men of Akshehir died. His wife was crying. Oh, my husband! Where have you gone? There is no light, there is no food, there is nothing! When the Hodja heard this, he ran home and said to his wife. My wife! Open the door! The coffin is coming to our house! Dear Hodja, tell us, where should we go in a funeral procession, in front, at the back, or at the side? The Hodja answered, It doesn't matter where you go, as long as you don't go in the coffin. You, Hodja, you have cheated me! The Hodja, in turn, was very angry and shouted back: You silly man, haven't you any sense, whom do you believe, me or the donkey. Tell me, Temur, will you take your army and go away from Akshehir or not? The Sultan was astonished and wanted to know what he meant. No comment, said the Hodja. Tell me, will you take your army and go away from Akshehir or not; If not, I know what to do! Now the Sultan became very angry and said: If I don't, what will you do then? The Hodja replied: What will I do? I'll take the people of the town and we'll go away! When the Hodja was going somewhere, he got on his donkey with his back facing to front. Hodja Effendi, the people said. You are sitting on your donkey the wrong way round. No, he said. It's just that the donkey is standing the wrong way round. "Hodja, why do people yawn? There are two reasons: One of them is tiredness, the other is hunger. One day the Hodja wanted to get on his horse but he couldn't reach his aim. Oh, what a shame, he said aloud. That I am not young as I was in the old days. I know how you were in your youth! Copyright © 2000-2005, Sivrihisar.com - Sivrihisar.net, All rights reserved.